Chicken Soup for the Soul: On Being a Parent includes the best selections on parenting from Chicken Soup for the Soul’s rich history, with 101 stories carefully selected to appeal to both mothers and fathers. Parenting is the hardest and most rewarding job in the world. 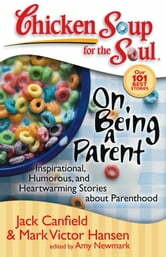 Filled with stories on the humor, hard work, and joy of being a parent, this is a great book for couples to share, whether they are embarking on a new adventure as parents or reflecting on their lifetime experience.